* An American Library Association Best Graphic Novel for Teens! 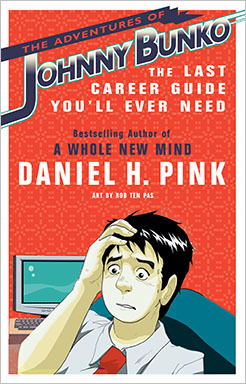 From Daniel H. Pink, the #1 bestselling author of Drive and To Sell Is Human, comes an illustrated guide to landing your first job in The Adventures of Johnny Bunko: The Last Career Guide You’ll Ever Need. There’s never been a career guide like The Adventures of Johnny Bunko. Told in manga—the Japanese comic book format that’s an international sensation—it’s the fully illustrated story of a young Everyman just out of college who lands his first job. Daniel H. Pink is the New York Times bestselling author of A WHOLE NEW MIND and FREE AGENT NATION. He lectures to corporations, associations, and universities around the world on economic transformation and the changing world of work. In 2007, he won a Japan Society Media Fellowship that took him to Tokyo to study the manga industry. Pink lives in Washington, DC, with his wife and their three children. Rob Ten Pas is the winner of TOKYOPOP’s annual Rising Stars of Manga competition. He received a B.A. from the Minneapolis College of Art and Design and now lives and draws in Wisconsin.